1.) Heart Rate Monitoring: Professional statical and dynamical heart rate monitor, plan appropriate physical exercises. 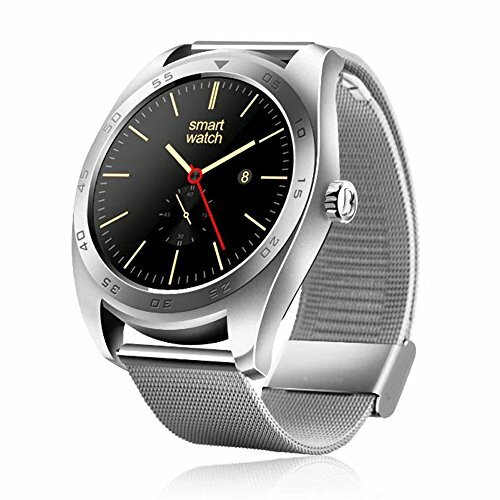 SMARTWATCH UNIQUE: Fashion, elegant, stylish, perfect combination of sports and health, loudspeaker built-in, and multiple UI to change will provide a comfortable wearing experiences. It is really a perfect gift for your father, husband, boyfriends, brothers. ACTIVITY TRACKER AND HEALTH STEWARD: All day activities track (Pedometer, distance,calorie) for running or walking, analysis your running state, sleep monitoring (sleeping time, sleeping quality), professional statical and dynamical heart rate monitor, sedentary reminder, and so on. MEDIA ASSISTANT: After connecting with your smartphone, you can switch, pause and play music via the smartwatch, turn your wrist to take photos, even make or answer a call directly from watch since it is built-in speaker, very convenient. If you have any questions about this product by MOREFINE, contact us by completing and submitting the form below. If you are looking for a specif part number, please include it with your message.